View More In Coffee, Tea & Espresso. The Nespresso Pixie by Breville espresso machine offers avant-garde design with elegance and functionality. Equipped with a wide range of advanced features, the Pixie machine is energy efficient with a surprisingly compact design. Only 4.33 inches wide, it uses hardly any space and is perfect for smaller urban kitchens. At only 8 pounds, it is also easily portable. The one-touch buttons with two capacities (espresso and lungo) can be reprogrammed to custom volumes and are backlit for ease of use. The 19 bar high-pressure pump allows for barista-style result, unlocking the delicate flavor and premium aromas of each Coffee capsule during the brewing process and creating an incomparable dense and unctuous crema. The fast heat-up system reaches the ideal temperature in just 25 seconds, while the automatic power-off-function means the machine turns off 9 minutes after the last use. Streamlined for maximum efficiency, this Coffee maker lives up to Nespresso's reputation for high-end technology. 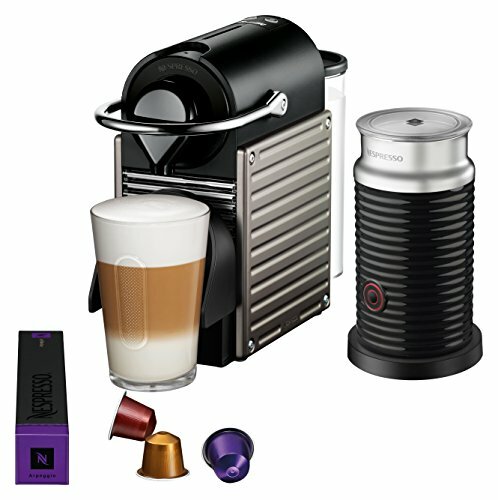 Each machine includes a welcome set with 16 Nespresso capsules, containing individual aromas. Nespresso Pixie espresso machine by Breville with Aerocinno includes the Aeroccino 3. The Aeroccino 3 provides a smooth, finely textured hot or cold fresh milk froth in an ultra-simple and fast automatic system, in a few seconds, without noise or vibration. The simple operation works with a one-touch button and the Anti-stick coating ensure easy cleaning. Nespresso Pixie by Breville has a 19 bar high-pressure pump that allows for a barista-style result, unlocking the delicate flavour of each coffee capsule; Designed for use with Nespresso OriginalLine capsules. The fast heat-up system reaches the ideal temperature in just 25 seconds. The machine automatically turns off after 9 minutes, consuming less energy. The one-touch buttons with two cup capacities (Espresso and Lungo) can be reprogrammed to custom volumes. Red backlights light up to let you know when you need to refill the 24 oz. water tank. Each machine includes a welcome set with a range of Nespresso capsules with unique aroma profiles. To create the perfect finish to your coffee or espresso, the new Aeroccino 3 milk frother is included. If you have any questions about this product by Breville, contact us by completing and submitting the form below. If you are looking for a specif part number, please include it with your message.